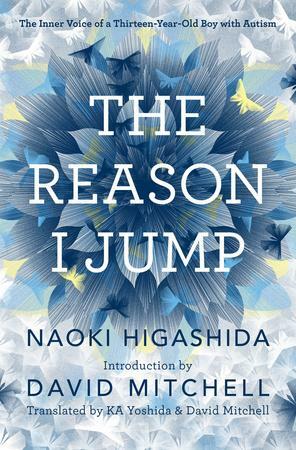 The Reason I Jump, by autistic Japanese teen Naoki Higashida, joins a recent spate of books featuring autistic characters. We talk with novelist David Mitchell about how translating Higashida’s book into English transformed his understanding of his own son’s autism. Mike Doherty is a writer based in Toronto. In an obsessively interconnected world in which everyone everywhere is encouraged to share everything all at once, our attention spans grow threadbare, and signals are increasingly drowned out by noise. It’s natural, then, that we should be drawn to the stories of those for whom communication itself is a nightmare. Naoki Higashida’s book The Reason I Jump: The Inner Voice of a Thirteen-Year-Old Boy with Autism is ostensibly a handbook on how to understand young people with the Japanese teenager’s disorder, but Higashida’s pleas for empathy and time—“We really badly want you to understand what’s going on inside our hearts and minds”—are resonating with “neurotypicals” too. Higashida, a native of Kimitsu, near Tokyo, wrote The Reason I Jump in 2007. Its English translation, by novelist David Mitchell (Cloud Atlas, The Thousand Autumns of Jacob de Zoet) and his wife, Keiko Yoshida, appears at a time when fiction about teenage boys who seem to be on the American Psychiatric Association’s “autism spectrum”—typified by “problems with thinking, feeling, language, and the ability to relate to others”—is growing in popularity. From Mitchell’s native UK alone have emerged Iain Banks’s last novel, The Quarry (published in June), Gavin Extence’s debut, The Universe Versus Alex Woods (published in May in the UK, in June in North America), and the wildly successful theatrical version of Mark Haddon’s 2003 novel The Curious Incident of the Dog in the Night-Time, which debuted last year. And The Reason I Jump has been a bestseller in Britain since its publication in July. In his introduction, Mitchell offers a “thought-experiment” to represent what goes on in the mind of someone with autism: it resembles sensory overload. “A dam-burst of ideas, memories, impulses and thoughts is cascading over you, unstoppably.” Where neurotypicals have internal “editors” that filter things out, “people with autism must spend their lives learning how to simulate” their functions. Higashida’s fictional counterparts, like Haddon’s narrator, Christopher, are constantly trying to cope with the overwhelming, intrusive nature of people around them, well meaning or otherwise; they have to figure out how to interact with others by deduction rather than intuition. In Curious Incident, Christopher considers himself a detective, attempting to discover who killed a neighbour’s dog, but also how to interpret other people’s emotions and desires from visual cues he’s not attuned to picking up. There’s something of him in The Quarry’s 18-year-old Kit, who refers to himself as “very clever, if … weird, strange, odd, socially disabled, forever looking at things from an unusual angle.” Similarly, Extence’s Alex Woods has a remarkable gift for astronomy but often has trouble relating to people: “some said,” he reflects, “that I didn’t even feel emotions in the same sense that regular people with regular brains did.” He’d rather read Kurt Vonnegut than make friends at his school. Granted, none of these characters is ever explicitly identified as autistic in the books, or as having Asperger syndrome (considered by the American Psychiatric Association to be part of the autism spectrum). Alex Woods’ condition appears to derive not from genetic or environmental factors, but from being struck on the head by a falling meteorite. Haddon has said he doesn’t want to “exclude people” by defining his sympathetic narrator’s condition in any way, but he has admitted that if Christopher were diagnosed, he would be said to have Asperger’s—a manifestation of autism where language and cognitive development are not delayed. Central to all of these books is that fact that for their protagonists, the Forsterian motto “Only connect” is a near-impossibility. But it’s not for lack of trying, or for an impoverished inner life. In his survey “Autism Fiction: The Mirror of an Internet Decade,” philosopher Ian Hacking identifies a theme in contemporary literature of “the nerd as autist and the autist as nerd,” brought about by the internet’s creation of “a communicative life other than the ancient neurotypical one.” Via text and email communication, “No longer do I look at you, make eye contact, or notice bodily discomfort, when we are talking to each other. … We form social groups of people who would not even want to set eyes on each other.” For Hacking, neurotypicals and those with autism are starting to resemble one another. The experience of a narrator with symptoms of autism could be viewed by neurotypical readers as an analogue for their own—how they’re confronted with too many demands on their time, too many screens and messages jostling for their attention, their inner “editors” increasingly unable to cope. The caveat remains that stories such as Christopher’s are fiction, and moreover, Mitchell is keen to distinguish between people with Asperger syndrome and those with a more severe form of autism. “Asperger’s is a gift to novelists” in creating characters, he says. “You get a highly articulate individual whose very difficulties with relationships and the processing of emotions allow a fiction writer to bring to the surface these issues that a novel is naturally interested in.” Indeed, young-adult males have made useful outsider figures for authors determined to expose the follies of their worlds, from Hamlet through Catcher in the Rye. What with the rise in diagnosis (autism is now identified in 1 out of 50 schoolchildren in the U.S., and mainly in boys), the archetypal 21st-century outsider may turn out to be the teenager with autism.